Alabama Executes Serial Bomber Walter Leroy Moody, 83 : The Two-Way Moody killed a federal judge at his home in Alabama and a civil rights attorney at his office in Georgia. He is the oldest U.S. inmate executed since the death penalty was reinstated in 1976. Walter Leroy Moody, seen in a photo provided by the Alabama Department of Corrections, targeted the NAACP and the federal court system with bombs in 1989. 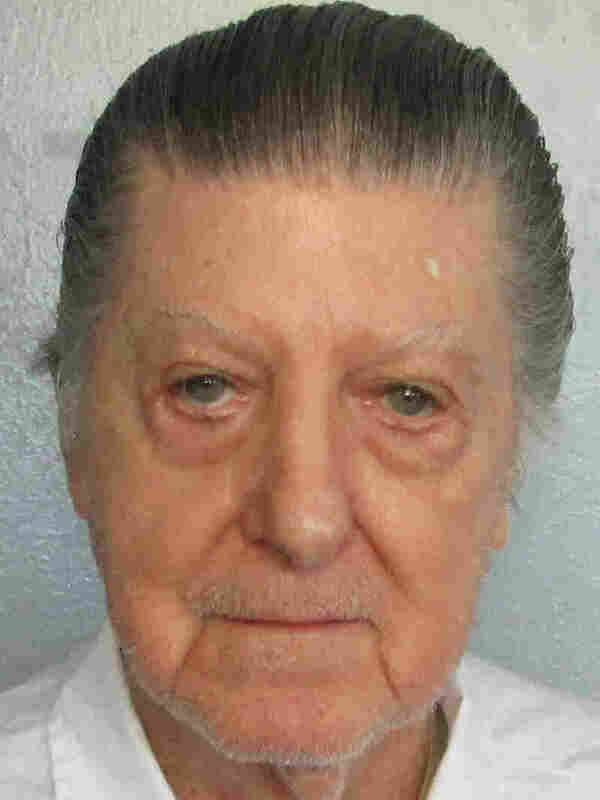 Alabama has executed 83-year-old serial bomber Walter Leroy Moody by lethal injection. Moody is the oldest inmate executed in the U.S. since the Supreme Court reinstated the death penalty in 1976, according to the Death Penalty Information Center. The Associated Press reports that he made no response when asked if he had any last statement. Moody built shrapnel-sheathed bombs hidden in packages rigged to explode when opened. In 1989, one of those bombs killed 11th Circuit Judge Robert S. Vance at his home in Mountain Brook, Ala., and two days later, another bomb killed civil rights attorney Robert E. Robinson at his office in Savannah, Ga. The Alabama bomb also seriously injured the judge's wife, Helen Vance. Around the time of the attacks, an Atlanta television station received a letter threatening more attacks on judges, attorneys and NAACP leaders. As his case has wound through the legal system and exhausted a string of appeals, Moody has often acted as his own attorney — including when he petitioned that same 11th Circuit Court for a writ of habeas corpus, triggering his plea to the Supreme Court. In addition to targeting the NAACP, Moody declared a deadly "war on the federal judiciary," Alabama Attorney General Steve Marshall said in a filing to the Supreme Court in response to Moody's petition. Prosecutors say the 1989 attacks stemmed from Moody's 1972 conviction for possessing a pipe bomb that exploded in his home, injuring his wife. He served three years in federal prison. That early attempt at a pipe bomb would later prove to be Moody's undoing: The same federal expert who worked to defuse one of the bombs Moody sent in 1989 recalled seeing similar work in Georgia years earlier. That put investigators onto Moody's trail, and he was arrested late the next year. Marshall, the attorney general, said Moody had attended law school and was obsessed with getting his 1972 conviction overturned so he could practice law. When Moody appealed the verdict in the 1980s, prosecutors say he concocted alternate evidence and testimony. He also petitioned a federal district court to vacate the conviction. That court turned down the petition — and the 11th Circuit "affirmed the denial of that relief in June 1989," Marshall wrote in the Supreme Court filing. That same summer, Moody and his then-girlfriend, Susan McBride Samford, began amassing the tools and materials he would need to build bombs. First came a tear-gas bomb that hit the regional NAACP office in Atlanta in August. Then, in December, the four pipe bombs were mailed to their targets, including Vance and Robinson, both prominent and well-respected men. Robinson had helped desegregate a beach near Savannah as a teenager in the 1960s. He later became a city alderman and "was considered one of Savannah's rising stars," as local TV WSAV has reported. Vance "was a lawyer here in Birmingham," his son, Bob, said in a recent video by AL.com. Bob Vance, who is now a county circuit court judge, added that his father was "also very involved politically in the Democratic Party, back in the day when it was struggling with the issues of civil rights." Moody was tried in both federal and state courts. He was convicted of dozens of counts, from murder to obstruction of justice, and was sentenced to serve consecutive life terms without parole. In February 1997, he was sentenced to death by an Alabama circuit court in Birmingham.